Palmyra is the official tree of Tamil Nadu, India. Palmyra is one of the tree in which all of its parts are used. Everyone is saying that its a green cover. Main advantage of these trees are will resist to the any drought situation. It can withstand with one or two rainfall in a year without watering. In olden days people used to grow these trees around ponds / water resource. Those tap roots will search for water from the lower ground level and helps to maintain the surface water. There were number of trees in and around south India till few years back but now those trees are cut down and used as fire wood for making bricks. Due to that water level also gone down to 1000 ft or even more in some places. Even in our field in and around I have seen there are many trees till few years back. But now the number of trees got reduced mainly because of drought situation and people moved towards real estate as nothing is possible with the land without water. In the below picture you can see the fruit for Palmyra. When to cut open this you can see a jelly like seeds which is good to eat. 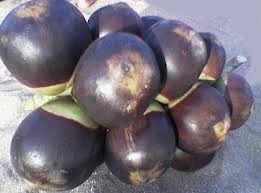 Before ripe if you cut these fruit you can get a sweet liquid which is very good to make our body cool. 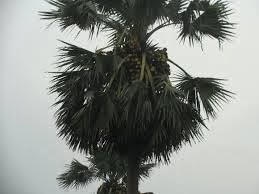 Leaves of these trees are used for making shelter, fans, baskets, hats and umbrellas. In ancient days these leaves are used for horoscopes, poems and as writing material. My grand father’s horoscope itself written in palm leaves only.